• The Ocean Explorers Camp is designed for incoming 7th and 8th graders. Campers must meet this age requirement. • Class capacity is limited and enrollment is based on a first-come, first served basis. • Multiple-day camps cannot be purchased as one-day camps. • All registrations must be paid in full to reserve your child’s space in camp. • We accept Visa, MasterCard or American Express. You may also pay cash in person at the Box Office. • Museum members may also pay by personal check. Checks should be made payable to: Museum of Discovery and Science. • To ensure that your enrollment is processed quickly and accurately, please complete and submit all of the registration forms. • A camp registration confirmation will be sent to you once your child’s registration has been processed. • The Museum reserves the right to combine like age levels to meet minimum attendance requirements. • The museum reserves the right to cancel a program if minimum enrollment has not been reached. • Campers should daily bring two snacks, lunch and a drink. Please review and complete the downloadable registration forms. There are four ways to register. Please submit your forms using one of these methods. Full refunds will be made only if the camp is cancelled by the Museum of Discovery and Science. Partial refunds will be made only if the Museum is notified of the cancellation at least 10 working days prior to scheduled camp date. No refunds will be processed after the cancellation deadline. A 20% processing fee will be retained on all cancellations unless the program has been cancelled by the museum. 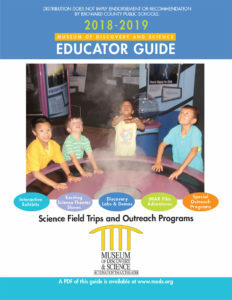 From time to time, the Museum of Discovery and Science takes photographs during classes and camp. These photographs are used for many purposes, including advertising and promotional materials. Should you have any objection to the Museum taking or using photographs of you or your children, please call and advise a reservations agent before your child’s camp begins. This information will be placed in your child’s record.